If Darren Weir’s opinion of boom sprinter Nature Strip is right then the champion trainer could soon have two contenders locked away for The Everest. While discussing Brave Smash, last year’s third placegetter and already a confirmed starter in 2018, who is almost four weeks into his preparation Weir made his views on Nature strip very clear. “He's as good a horse as Brave Smash,’’ Weir said. 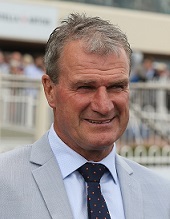 Darren Weir is hoping to have two runners in The Everest. (Pic: Grant Guy). In 10 starts in Australia, Brave Smash has won a Group 1 (Futurity), plus placed in a Newmarket Handicap and an Orr Stakes, and a Listed race as well as his Everest third. Nature Strip has only had eight starts to date for five wins and his only unplaced run was in Group 2 company in Adelaide. Such is the boom on Nature Strip he’s already rated a $15 chance with TAB despite not being a confirmed runner while Brave Smash is the same price. The three-year-old will be strongly favoured to post his first Listed win in the Creswick Series Final (1200m) at Flemington this Saturday and reignite talk of a slot in the $13 million feature at Royal Randwick on October 13. Brave Smash wasn’t tested at the top level in Australia prior to running in The Everest – he tackled three Listed races as lead ups. Weir said Brave Smash, who will race in the slot owned by Chris Waller Racing, will contest The Everest at either his third or fourth run in the spring but hasn’t yet settled on a race plan. “It's all mapped around the Everest so he's in work at the right time,’’ he said. “He's just cruising along. The boys were keen to aim I towards it last year and we were lucky enough to run third. “It's good to know you're in it and you don't have to worry about winning something to get in. Weir said the best of Brave Smash certainly wasn’t see in the Sydney autumn as he failed in the TJ Smith Stakes and All Aged Stakes behind TAB’s Everest favourite Trapeze Artist. He said the five-year-old found the ground a bit firm in the latter race. “He ran terrific down the straight, he went to Sydney and we thought he would go really well and he was disappointing in the TJ,’’ he said. Six horses are confirmed for The Everest – Trapeze Artist, In Her Time, Redzel, Brave Smash, Shoals and English. Tickets for The Everest are on sale now - starting from just $25 for early birds.